The smell of crab is distinct, whether it’s cooked or decomposing in the sun. If I touch it, it will be dry and crispy. It might fall apart in my hand if I try to pick it up. 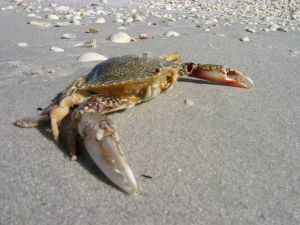 Seeing a dried-out crab washed up on the beach is just as sad as a bird hitting my livingroom window and cracking its skull. However, a bird dive-bombing into one of a thousand windows on a skyscraper is sadder than the previous two. Is a bird splattered against a skyscraper just as sad as a duck stuck in one of those plastic six-pack rings? Only with the duck you can at least have a chuckle about how silly it looks; the duck’s ignorance about its silly appearance is kind of funny, too, if you’re the type of person who can appreciate cruel irony. There’s not much about a dead crab that could be called funny. A puppy smushed by an SUV. Baby birds stumbling out of the nest for the first time only to fall to the ground far below and break their little necks. A child who has just learned that adults lie. Guess what? Obama is the only president known to have killed pirates. I bet JFK picked off a few when he was in the Navy that we just don’t know about. Even cooler, Somali pirates have vowed revenge on the US. Also, Newt Gingrich is a fucktard.But everyone probably already knew that.